For years, Café C’est La Vie has offered a little corner of France on the Oregon Coast, serving up gourmet crêpes, pastries and coffees with the style one might expect to find on a Parisian boulevard. But fortunately, Cole’s culinary talents turn out to run in the family, and she was able to talk her younger brother Thomas Ramsey into donning the chef’s hat and keeping the crêpes flowing until her return. Thomas, who has been at the helm for the past four months, said he had always admired what his sister has built. So Thomas set about making a few changes, moving the cooking away from the front of house and into a back kitchen, giving more room for staff and customers alike — and a shorter walk to the dishwasher. But right now things are anything but slow. 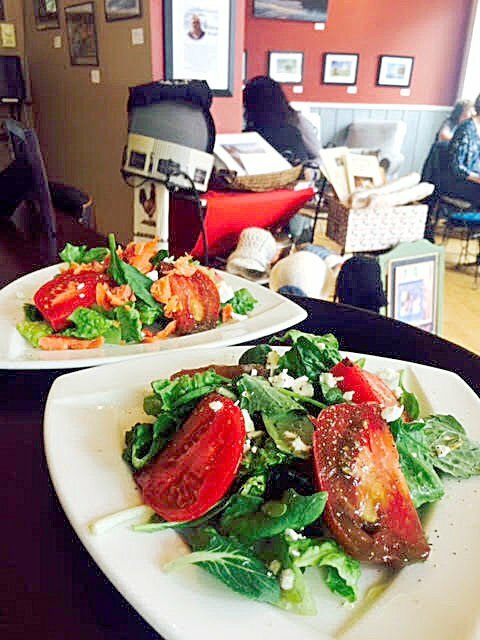 The café is bursting at the seams with regulars and visitors enjoying a summer getaway to the surrounding Bella Beach neighborhood. In marshalling the café’s staff during the busy season, Thomas has drawn on his experience earned as manager of the Dory Cove and Mr Bill’s Smokehouse in Lincoln City. Cooking is something of a specialty for Thomas and his seven older siblings, although he said his style is quite different from Penelope’s. So far, Thomas has put his baking prowess to work establishing the café’s own sourdough yeast culture and building up its scone selection, with two to four varieties on offer every day and receiving rave reviews. Elsewhere, Thomas has streamlined the specials section on the printed menu in favor of an expanded specials board, which allows him to run more one-day specials as and when ingredients become available. Nearly all the café’s beloved crêpes remain on the menu, something Thomas said was important in keeping the spirit of Penelope’s café alive until she returns from her travels in September. Those favorites include sweet classics like the Suzette and savory delights including the Forest, a combination of roasted mushrooms, zucchini, red pepper, French shallots and Swiss cheese topped with a red pepper cream sauce. And Thomas’ efforts have met with approval so far, both in word of mouth recommendations as well as online review sites such as yelp. But perhaps the most important approval came from Penelope herself, who made a habit of stopping by in the weeks before her departure to grab a bite and chat with regulars about how the transition was going. And even now, happily ensconced in the mountainous Bắc Kạn region of northern Vietnam, it is clear that Penelope is already dreaming up new dishes to share upon her return. And Penelope will be bringing back more then recipes, with a collection of culinary and cultural images from Vietnam slated to fill the café in October. The current art exhibit features stunning nature photography from Dennis White, perfect for customers to enjoy over a long lunch or during an evening visit on Friday or Saturday, when the café stays open until 9 pm, serving a range of evening meals accompanied by European beer and wine. Café C’est La Vie is located at 8 Bella Beach Drive off Highway 101 in Lincoln Beach and is open from 8:30 am to 3:30 pm on Wednesday, Thursday and Sunday and from 8:30 am to 9 pm on Fridays and Saturdays. For details, call 541-764-2828 or email thecafelavie@gmail.com.